Update 11/9 – I spoke to the vet this morning and Kwanzii is home I will update when I hear more. Thank you to all for your donations and concern. My name is Angela and I happen to have the most compassionate son in the world. 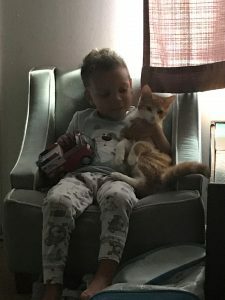 He lives all things and a year ago all he wanted for his 3rd birthday was a cat. We already had 2 dogs so we were not sure how that was going to go. He was very persistent and we gave in. A lady down the street took in a cat that was homeless when it was not very warm outside. That cat ended up being pregnant. A couple of us around the neighborhood ended up taking this kittens. We definitely have the most awesome, social, lovable cat I’ve ever met. Unfortunately he got Into some dental floss. Now the floss is wrapping around his small intestine potentially cutting holes in his intestines which will cause him to die. he is part of our family and it would devastating to us all especially my son if something happened to his cat. We are in desperate need and I’m sure we will have to put him down if it comes to surgery because we do not have the funds to pay for the surgery.